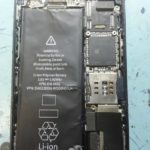 Chitika has already pointed to a high adoption rate of iOS 6 before the 2013 Worldwide Developers’ Conference kicked off, and Tim Cook pointed to the same numbers while he was onstage. Now Apple has posted the same pie chart format Google has on its public developer site (via AppleInsider). The main difference between the two charts is one highlights an essential information: developers only need to target the latest operating system. While speaking on June 10th, Tim Cook quickly compared iOS to other platforms — of course we are talking about Android – and pointed to the high iOS 6 adoption rate unique to Apple users: 93%. 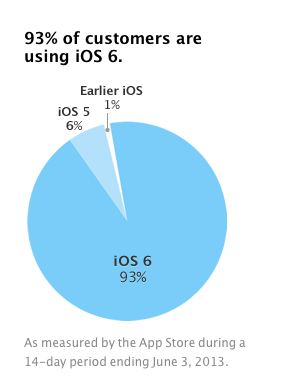 As you can see in the above chart, iOS 5 users account for only 6% of the total while earlier iOS account for 1%. This doesn’t stop game developers though from making their games compatible with, let’s say, iOS 4.3. Apple expects its upcoming iOS 7 to enjoy the same rapid adoption rate that iOS 6 did. A day after iOS 6 was released it already accounted for 15% of the web traffic recorded by Chitika in the U.S. and Canada, and 60% after a full month of availability. Will Apple manage to repeat this success? Considering Ive’s signature on iOS 7 and the great features it offers, probably yes.